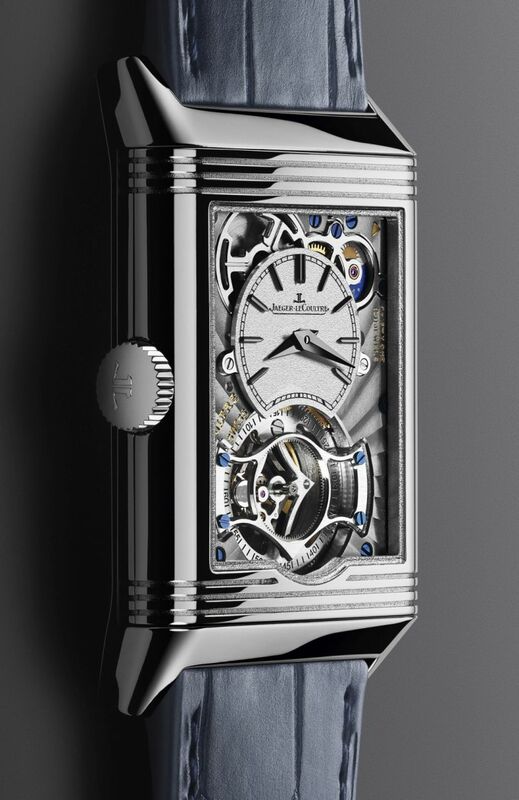 To mark its 185th anniversary, Jaeger-LeCoultre is taking a new step in terms of mechanical and aesthetic expertise. 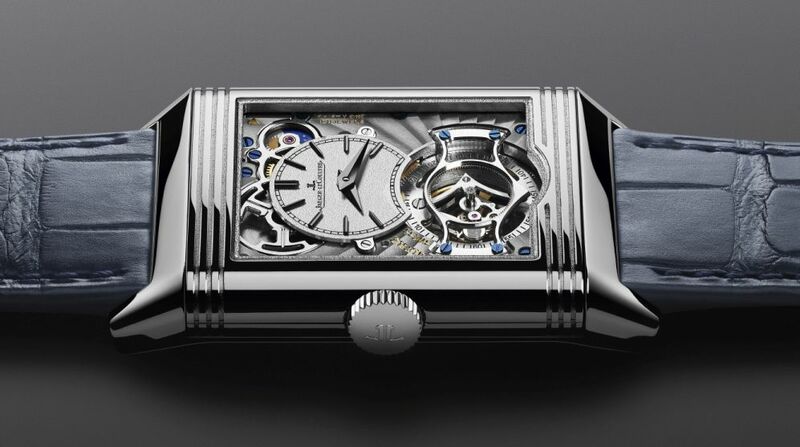 The new Reverso Tribute Tourbillon Duoface is a highly anticipated version of the Reverso Tribute. 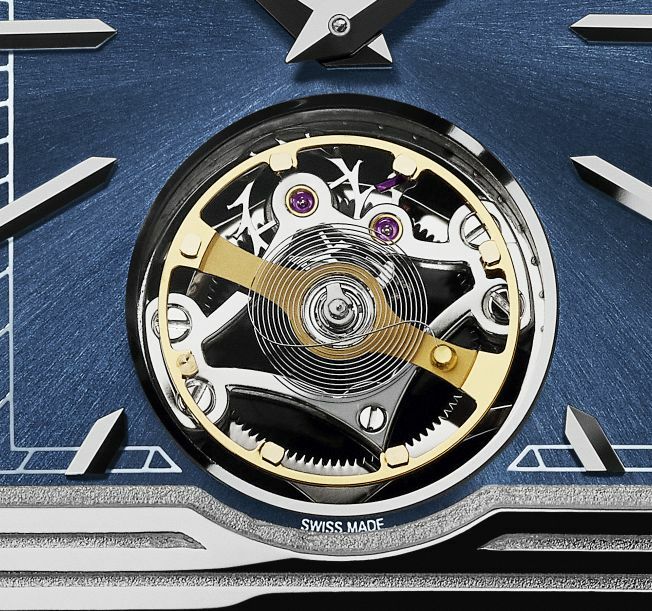 The new vision of the iconic model brings together the flying tourbillon with the Duoface concept, two techniques that represent absolute sophistication. 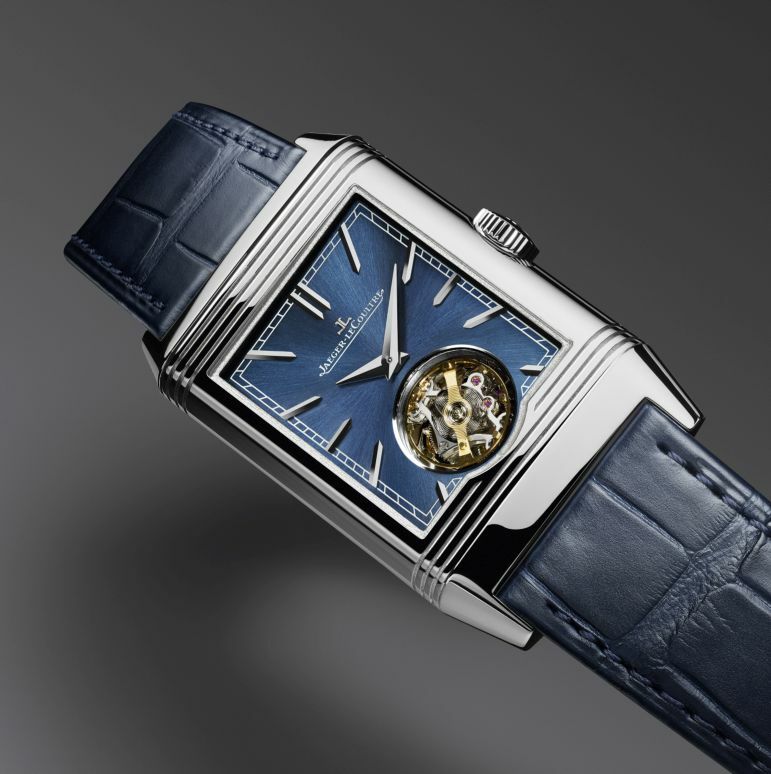 Equipped with the new manually wound calibre, Jaeger-LeCoultre Calibre 847, this unique timepiece is a show of exclusivity down to the very few number of models produced. This limited edition will be kept to a mere fifty pieces, each representing a pure expression of unique watchmaking expertise. Following in the footsteps of iconic models such as the Hybris Mechanica 11 and Reverso Tribute Gyrotourbillon, this exceptional timepiece boasts ideal proportions, a sign of refinement highly sought after and cherished by connoisseurs. The quest for pure finesse has certainly been a driving force for the watchmakers of the Grande Maison, both in the original design of the Reverso Tribute Tourbillon Duoface and in the exceptional quality of its finishes. Remarkable in more ways than one, the technical feat achieved here is maintaining the tourbillon's moving carriage and its sprung balance through the use of an ingenious ball-bearing system, all while still offering the freedom to express oneself fully on the back of the watch. A single watch that offers two-time zones on two separate dials is at the heart of this revolutionary concept. Developed in the workshops of the Manufacture, the concept of reversibility is an inexhaustible source of inspiration for Jaeger-LeCoultre to this day. Suffice to say, with two distinct but inseparable faces, the illustrious Reverso Tribute seems to possess the ideal design to house this complication. The design of the Duoface has been completely revamped, resulting in an entirely new layout so that all the various components can fit into a platinum case measuring a mere 9.15 millimetres. The result is two hand-fittings in a single movement brought together with a grand complication, a challenge that remains formidable to achieve. Designed with stylistic codes borrowed from Art Deco--the same that have characterised the legendary Reverso ever since its creation in 1931--this new opus pays homage to the original models, timepieces which are inseparable from both the history and heritage of the Manufacture. Timeless and inimitable, the specific codes of this collection have been applied with an impeccable level of respect. 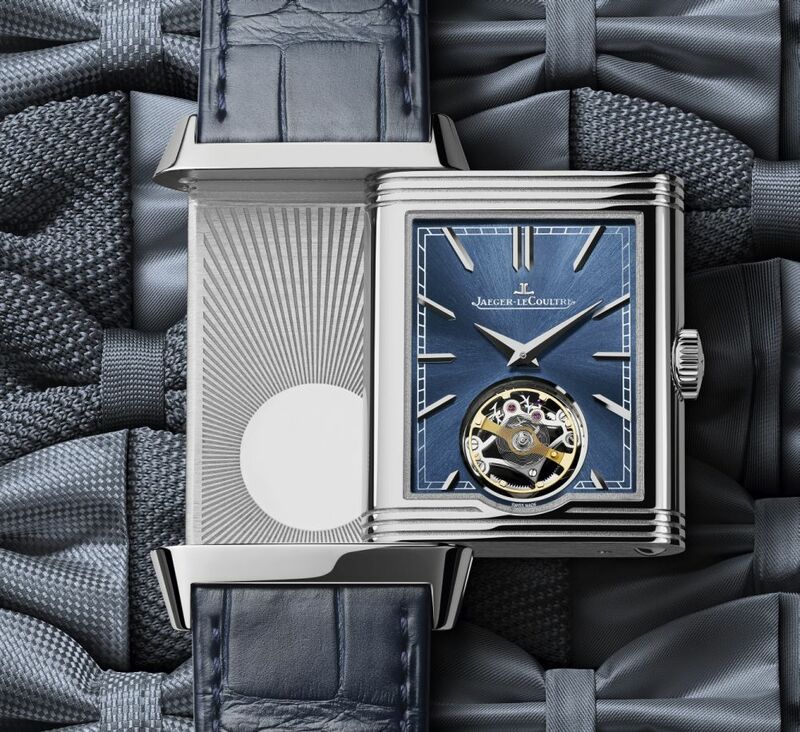 A blue sunrayed dial and silvered hand-applied hour-markers adorn the front side, with Dauphine hands that seem to step aside as the haunting spectacle of the flying tourbillon takes centre stage, swaying as though weightlessness at six o'clock. On the opposite side, the grained dial and Côtes de Genève finishes make the perfect housing for emblematic functions like a second time zone, small seconds, or the day/night indicator discreetly nestled at 2 o'clock. With a simple move of the finger, the watch offers up one of its two faces, each possessing an aesthetic at once complimentary and diametrically opposed. The front, adorned with deep blue, is a bold expression of elegance. The opposite side, with a rough metal effect, strives for a sober and streamlined aesthetic. Both sides bear the same flying tourbillon, a feature that brings ultimate sophistication, its lower portion lodged within the platinum case, giving it a slightly rounded and curved shape. The effect is a nod (or all-out salute) to discerning collectors who are sure to be seduced and enchanted by the subtle touch. The case, in platinum, measures 45.5mm x 27.4mm x 9.15mm. It has double sapphire crystals and it is water resistant to 30 meters. Movement is the Swiss manual-wind Jaeger-LeCoultre in-house caliber 847 with 31 jewels, 21,600 vph and a power reserve of 43 hours. Functions are: hours, minutes, Tourbillon with seconds indicator, a second timezone, and Night & Day indicator. It has a blue sunray dial on the top, and a silvered grained dial on the bottom. It comes on an blue alligator leather strap with an 18kt white gold buckle. MSRP is 122,000 Swiss Francs. Previous Topic: Should I trade my Grande Date for a 976?